Mendip memorials is located in the heart of the Mendip hills. We pride ourselves upon producing high quality headstones and masonry work through out the Avon, Somerset and South West regional area. 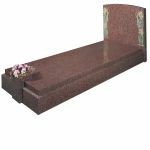 We offer a wide range of traditional and contemporary memorial designs and inscriptions produced using many different types of quarried stone, at very competitive prices. For placement in civic cemeteries, churchyards, gardens of remembrance, and also for export overseas. All our work is fully guaranteed for a 10 year period for workmanship, and 30 years for safety. Within this website you will find many examples of memorials that can be produced. However we are unable to show all our range and designs specific to certain cemeteries. Therefore if you see a design you like in a cemetery or another brochure/website, or can’t find what is required by a particular cemeteries regulations, please contact us for further information and a quote. If you should require any further assistance, we are more than happy to help advise you with your decisions, or if you would prefer a free full colour memorial brochure posted to you, please do not hesitate to contact us via telephone, post or email.